The most important pie chart in the history of humanity is this one. It shows our carbon budget, and how much CO2 we can emit and still have a 66% chance of staying below 2C global average temperature rise over 1850’s temps. Since the 1870s we’ve emitted about 2100 GtCO2 (Gigatons of CO2 (2100 billion tons)). 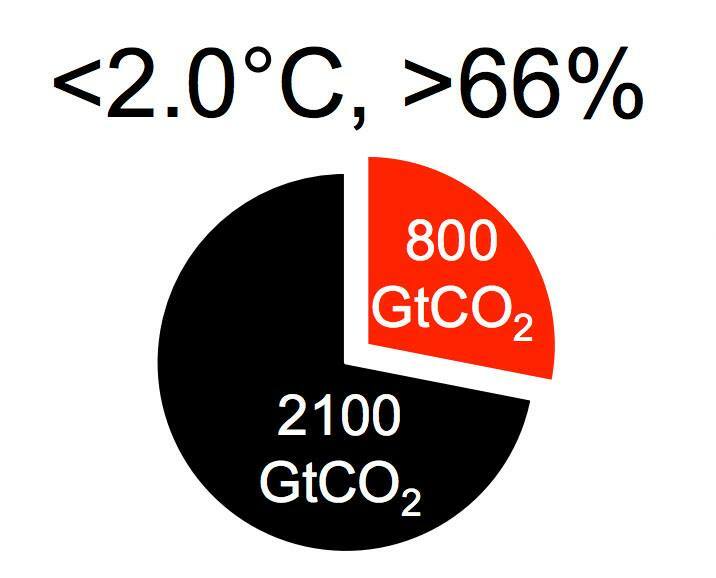 It is estimated that we can emit 2900 GtCO2 and have a 66% chance to keep global temperatures within a 2C rise. That means we have only 800 GtCO2 left to emit. We are currently emitting about 36 GtCO2 per year. 800/36 is 22. That is the number of years we can keep burning fossil fuels, and emitting CO2, at our current rates. 2C above pre-industrial global average temperature doesn’t sound like a lot but it is widely anticipated to be catastrophic, particularly to the most vulnerable people in the world who will lose their homes and their livelihoods, and who will have no assets to making simply moving elsewhere easy. This will leave them no recourse but to throw themselves upon the mercy of their governments, their insurance companies (if they have insurance) and the generosity of other countries. At least 150 million climate refugees are expected by 2050.